With his wily and unforgettable original songs and his hipster, street-smart vocals, no one on the blues scene writes or sings like Rick Estrin. No one looks like him either, as Estrin is always dressed to the nines, sporting his trademark pencil-line mustache and pompadour haircut. DownBeat says, "Rick Estrin sings and writes songs like the brightest wiseguy in all of bluesland and blows harmonica as if he learned at the knee of Little Walter." Live, the band is simply unbeatable. They deliver a high-energy show capable of bringing any audience to its feet. According to Living Blues magazine, they play "captivating, powerful blues and roots rock with a wickedly cool and otherworldly twist on tradition...intelligently conceived and executed...hugely entertaining." Rick Estrin & the Nightcats' fourth Alligator album, Groovin' In Greaseland, features 13 original songs, 11 by Estrin (including one co-written with Andersen), and one each by Andersen and Farrell. One listen makes it clear that this is one of the tightest and most original groups in any genre, constantly inspiring each other to new heights. Groovin' In Greaseland was produced by Andersen and Estrin and recorded at Andersen's soon-to-be legendary Greaseland Studio in San Jose, California. Besides Estrin's celebrated songwriting and musical skills, he and the band are among the most entertaining and colorful showmen around. Estrin's flashing harmonica solos, quick wit and signature look and Andersen's off-the-cuff guitar acrobatics add even more spontaneous fun to their live performances. "People don't go out to see people who look like themselves," says Estrin. "They want to see something special. I was schooled in this business to be a showman, and that's what you get when you come to see us perform. We know how to put on a show." Years of worldwide touring and a series of critically acclaimed recordings has earned Estrin five Blues Music Awards, including two nods for Song Of The Year (1994 and 2018), Best Instrumentalist - Harmonica (2013) and Traditional Blues Male Artist Of The Year (2018). 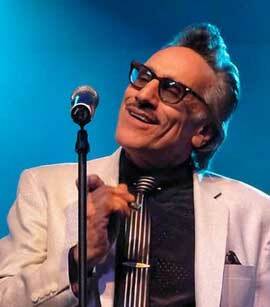 The full band, Rick Estrin & the Nightcats, won the highly coveted 2018 Band of the Year award. Additionally, Estrin has written songs for a number other musicians. Three of his songs found their way onto Grammy-nominated albums by Koko Taylor, Robert Cray and John Hammond. Estrin cites Sonny Boy Williamson II, Percy Mayfield and Detroit bluesman Baby Boy Warren as his major songwriting influences. His work on the reeds is deep in the tradition of harmonica masters Sonny Boy Williamson II and Little Walter Jacobs, while at the same time pushing that tradition forward with his innovative songs. His sly and soulful vocals are the perfect vehicle for driving those songs home. Blues Revue says, "Estrin has created some of the finest blues songs of any artist on the planet. His carefully wrought lyrics penetrate human weakness with the precision of a boxer, though more often than not, he chooses to leave you laughing after the blow's been struck." For more than 30 years and nine albums, Rick fronted Little Charlie & the Nightcats, flawlessly combining his songs, vocals and harmonica with Little Charlie Baty's one-of-a-kind guitar excursions. With Charlie's retirement from touring in 2008, Rick took over leadership of the band. He knew the only way to replace Baty's mind-melting mashup of blues, jazz and roots rock was to find someone with an equally insane and daredevil guitar approach. As luck would have it, Kid Andersen, who had been working with another harp legend, Charlie Musselwhite, became available. "Kid's a fearless nut on the guitar," says Estrin. "He's really the only guy who could fit in with us." The new band charged out of the gate with Twisted in 2009, One Wrong Turn in 2012 and You Asked For It...Live! in 2014. Rick Estrin & the Nightcats have not only picked up where Little Charlie & The Nightcats left off, they've taken everything to the next level. Now, with Groovin' in Greaseland they prove yet again why DownBeat calls them "marvelous and crowd-pleasing." Rick Estrin & the Nightcats continue to set the bar high, proving it night after night on stage somewhere around the country or around the world. Billboard called them "fabulous, remarkable and original." According to Blues Revue, "It just doesn't get any better." Movinmusic is taking offers for Rick Estrin & The Night Cats generally throughout 2020. Interested venue owners & promoters can contact us about his availability via e-mail or 0044 (0)1209 860067. C 1996 - 2019 Movinmusic - Contact: mike@movinmusic.co.uk 0044 (0)1209860067 PO Box 38, Penryn, Cornwall, UK, TR11 9YD Skype "Movinmusic"